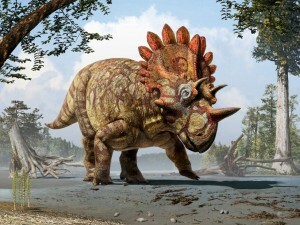 Scientists have discovered the skull of a new dinosaur, a feathered relative of the Triceratops, according to new findings released in Current Biology today. That’s right – first author Caleb M. Brown, based at the Royal Tyrrell Museum of Palaeontology in Drumheller, Alberta, proposed to his girlfriend in his paper. Current Biology is aware of the proposal and we are wishing the very best for the couple. I checked with several editors and this is a first for Current Biology as well as Cell Press. Beyond that, “A New Horned Dinosaur Reveals Convergent Evolution in Cranial Ornamentation in Ceratopsidae” has some interesting findings. Assuming O’Brien accepts, I wish them a long and enjoyable life together. They could publish the banns in the next (joint-) article. I am glad to hear that she didn’t respond with an expression of concern that would have resulted in his being forced to retract. I have to say I am glad that the paper didn’t take years to go through the system and the author didn’t have to wait too long to pop the question!! How scientist’s propose: Will you be my next experiment? I query this part of the post. is there an emoticon for my Expression of Concern? The logical endpoint of this is that people will start competing to get their marriage proposals published in “better quality/more selective” journals with higher impact factors. A journal’s Impact factor should definitely include the number of marriage proposals. Well, that’s one way to determine if she was really reading his publications. This Research article have shown the best way to Young unmarried scientists to propose his girlfriend. Hope in future research article will remain as a research article instead of being a love letter. Otherwise, unmarried scientists will start to use research article in the form of published love proposal. Fazil, with all due respects, did you read how the proposal was presented? It was in the acknowledgement section and not part of the actual research. I doubt very seriously that any person would comment to several years of research with the intent of writing a love letter to their girl friend, though I can think of at least two physicists who used what we could call dates to explain the cosmology and the electromagnetic spectrum. it appears that most are ok with such personal issues publicized in a scientific journal. fast forward – if the arrangement made here fails in real life, would the sentence be retracted? When for the first time i propose to a girl , she said you should speak with my father and get his consent. Her father ask me son what do you have in your life? I tell her father that i have a university degree and a bunch of published papers. Her father laughed at me and kicked me out of his home.